Matt Holliday (left) and Michael Wacha don't have to worry about roster spots. Not everyone is so lucky. ST. LOUIS — Enjoy the holidays, John Mozeliak. See you at the Winter Warmup. Once the Mark Ellis deal becomes official sometime this week, you will have completed your off-season shopping list, unofficially anyway. That should give you and the rest of your staff ample time to relax before spring training. Enjoy the down time because spring training promises to be exciting with the competition for jobs that will result from your off-season work. After hanging onto all the pitching, the Cardinals are looking at a nice battle for the rotation. Though four spots are pretty much settled with Adam Wainwright, Michael Wacha, Shelby Miller and Jaime Garcia, the fight for the fifth job should be fierce among Lance Lynn, Joe Kelly and Carlos Martinez. Then there’s center field, where incumbent Jon Jay will try to show he’s as worthy of everyday duty as newcomer Peter Bourjos. Mike Matheny will make sure Jay gets his chance, too. They’ll certainly be going at it like that at second base, where Ellis figures to give Kolten Wong a healthy push for playing time. Catching (2): Yadier Molina and Tony Cruz. Enough said. Pitching staff (12): Though at least one rotation spot is totally up in the air, the makeup of the staff is essentially set because the two who don’t make the rotation are pegged for the bullpen. The dozen: Wainwright, Wacha, Miller, Garcia, Lynn, Kelly, Martinez, Trevor Rosenthal, Jason Motte, Kevin Siegrist, Seth Maness and Randy Choate. Sorry, Tyler Lyons and Sam Freeman. Infield (6): The corners are taken by Matts — Adams at first and Carpenter at third. Put Jhonny Peralta at short, Wong and Ellis at second and that leaves Daniel Descalso and Pete Kozma going for one spot. Because Descalso has proven himself in the utility role and offers a left-handed bat, Kozma will need a huge, huge spring to make the team. 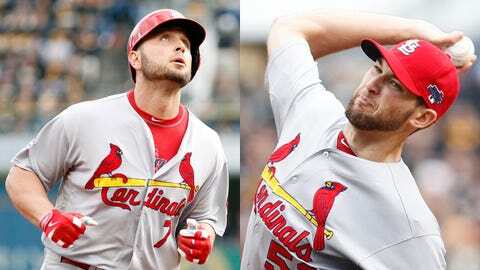 Outfield (5): Matt Holliday and Allen Craig will man the corners, with Bourjos most likely in center. That would leave Jay, Shane Robinson and Oscar Taveras competing for two backup spots. Taveras, the game’s top lefty-hitting prospect, offers the most intriguing situation as long as he has recovered from ankle surgery that ended his 2013 season in August. Mozeliak is confident the 21-year-old will be ready. Will the Cardinals want Taveras to play every day in Memphis or serve in St. Louis as an extra outfielder and late-inning pinch-hitter? Tough call. While Taveras would benefit from playing regularly, the Cardinals could use his power as a pinch-hitter. As much as their off-season has been commended from the outside, the Cardinals did not bring in a late-inning thumper. Taveras could help fill that void, and he also would learn a lot just from being a part of the Cardinals’ clubhouse. If Taveras makes the team, Jay could be the odd man out because Robinson is the lone right-handed hitter of the three. Then it would fall on Matheny to find Taveras at-bats much like the skipper did for Adams last year. One thing is certain: If Taveras shows he’s ready in the spring, the Cardinals won’t hold him back. You need only look at their young pitching last season to see how this plan has paid off. It goes beyond the arms, too. There was Craig in 2011, Carpenter in 2012 and Adams in 2013. Will Taveras be next? We should find out in a spring training that should provide far more excitement than the rest of the Cardinals’ hot-stove season. Cardinals Hot Stove Report airs Wednesdays in December and early January.